Chichen Itza is one of those places that you’ve probably seen pictures of a million times. When I moved to Mexico last year, I knew it was high on my Mexico bucket list. It’s a UNESCO World Heritage Site, it was one of the biggest Mayan cities, and it’s the most visited site in all of Mexico with more than 1.5 million people checking it out every year. That means it’s busy. We went on a Monday during a school holiday week and it was pretty crowded. Mexican citizens get in free on Sundays (it’s also cheaper for them every day of the week), so it’s best to avoid it on that day if you can. 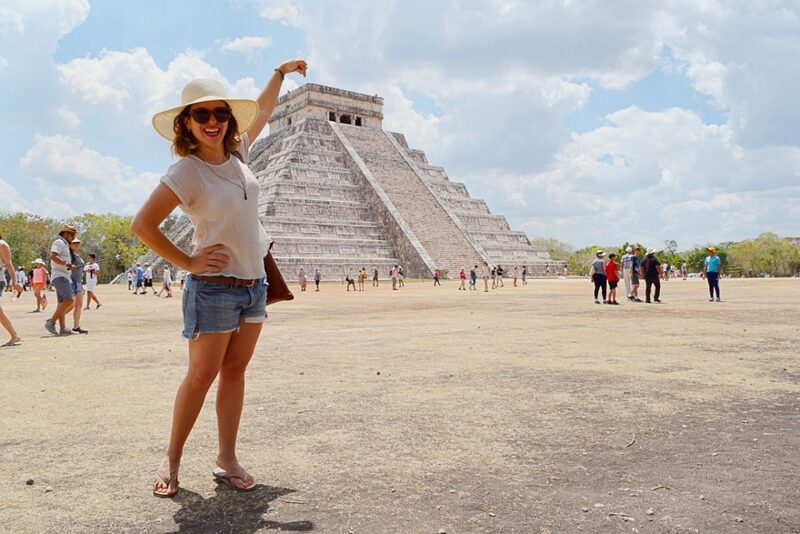 We didn’t go on a Chichen Itza tour, instead, we drove ourselves from Merida for the day and explored it on our own (and maybe we eavesdropped on a few English tours that were around us). Like I said, we didn’t go on a tour, but I did look at going with Olympus Tours. I’ve had great experiences with them in the past and if I had done a tour, I would have booked it with them. from Merida along highway 180D. Simply follow the signs for Chichen Itza. It is a toll road. I believe we paid just under 100 pesos ($5) each way. It took us just under an hour and a half. There was hardly any traffic on the road. We parked just outside the park for free. If you get there with enough time to park in the Chichen Itza lot (it fills up quickly), the fee is about 80 pesos ($4). You can also take an ADO bus from Merida to Chichen Itza. You have to be very careful with the times because they only run four a day in each direction. It costs 125 pesos ($6) each way. 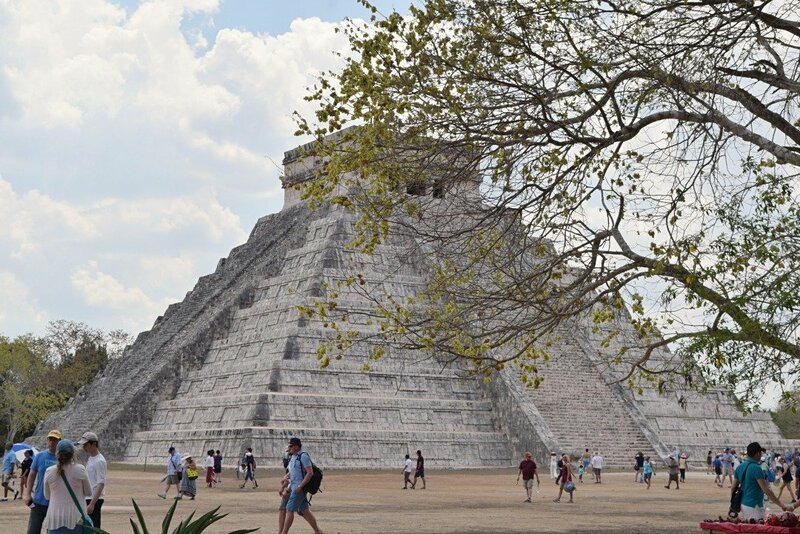 From Cancun: You can drive from Cancun to Chichen Itza in just under three hours. You take highway 180D, which, like I mentioned above, is a toll road. It’s slightly more expensive on the road from Cancun, a bit over 100 pesos ($5). You can take an ADO bus, but there is only one a day in either direction. It costs 192 pesos ($9.50) each way. 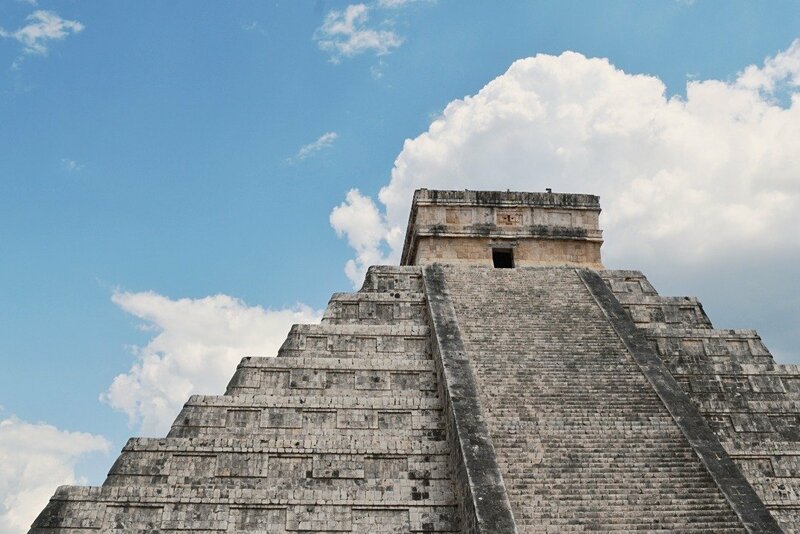 How Much Does Chichen Itza Cost? Entry to the park is really reasonable for everything that you get access to. For non-citizens, entry is 242 pesos ($12). If you are a Mexican citizen, entry is only 172 pesos ($9). If you are a Mexican citizen who is also a student, a teacher, over 62, or under 13, then you get in for free. Entry includes everything there is to see in the park. Food in the park is not over the top expensive, but it is slightly more than outside the park. A liter bottle of water cost us 35 pesos ($1.75) and an ice pop from one of the snack stands cost us 25 pesos ($1.25). There is also a restaurant just outside the park in the same pavilion as the ticket booth. It serves Yucatan food for roughly 200 pesos per dish (about $10). There are tons of souvenir vendors in the park as well. It’s mostly things that you can find in markets all over Mexico, but it’s still nice to browse. If you do see something you like, be sure to barter the price. We bought ourselves a wood carving and they initially quoted us 1500 pesos ($75) and we bartered it to 500 pesos ($25). They are quoting incredibly high prices in the hopes that you will simply accept the price. There are free toilets all over the park. Spending the day at Chichen Itza can be exhausting. We explored the park for almost four hours during the peak of the midday sun. I highly recommend packing a few essentials. A hat: Bringing a hat definitely saved me from sunstroke. I brought one with me, but there are tons of vendors selling them outside the park for about $1 USD if you forget yours. If you have dark hair like I do, you will want to keep your head cool with a nice light-colored hat. 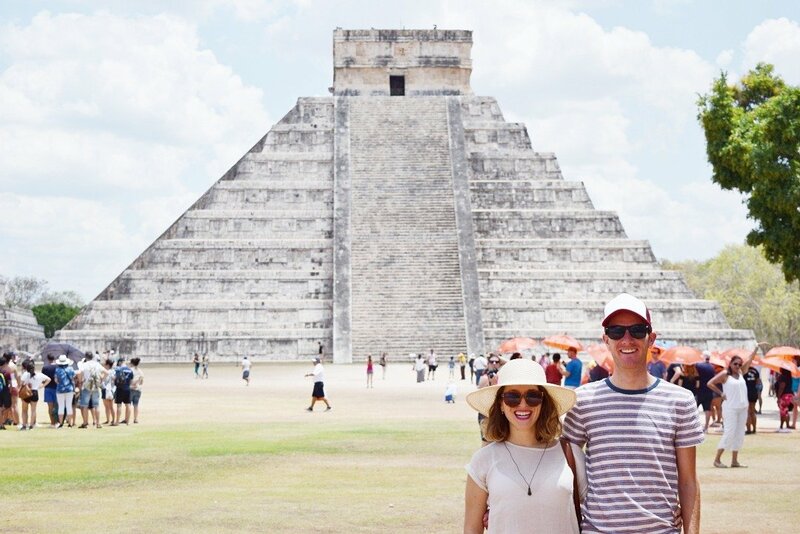 Plenty of sunscreen: We went to Chichen Itza in mid-April and it was about 85 degrees Fahrenheit (30 degrees Celsius). We brought a bottle of 30 SPF (these are my favorite brands) and applied it twice while we were there. An umbrella: I didn’t bring an umbrella, but a lot of tours provided them for their customers. You can also buy one outside the park to bring in with you. They’re not for the rain, they’re for the sun. It really does beat down on you in the open areas of the park. Shade is a rarity and having an umbrella might just save you from sunburn and overheating. Comfortable Shoes: You’re going to be on your feet for several hours walking around and sweating. I wore my trusty Rainbow flip flops, but it was so dusty there. I recommend either sneakers or some other type of comfortable walking shoe that covers your feet up from all the dirt. Cash: There are snack stands and souvenir stalls all over the park. If you plan on getting a gift to take home with you or you are hoping to keep your energy levels up with snacks and waters, you’ll need some cash. Some vendors will take U.S. dollars, but you’ll get the best price if you use pesos (the exchange rate they give for the USD is outrageous). Water: Bring plenty of water. You can buy it inside the park, but it’s about double the price of the same bottles you can buy at a local convenience store. You will definitely want to stay hydrated in the heat. Selfie-Stick: I know a lot of people loathe a selfie stick, but I kind of love mine. Most tourist sites in Mexico City have actually banned them, so I was concerned about bringing my GoPro pole with me in case they didn’t let me in with it. There were no signs that said you couldn’t bring them and even after my bag was searched I was allowed to take it in with me. Cameras: I had read that if you planned on using cameras, that you need to pay extra, but I never saw where I was meant to do that. When we got our tickets they never mentioned it and when I had my bag searched just before entering the park, they didn’t say anything about needing a permit, so I just went in with my cameras. I used my DSLR, GoPro, and camera to take photos and videos and I’m so glad I was able to capture the place in so many different ways. I even saw a guy with a tripod! If you’re going without a tour, you’ll definitely need to get yourself some food while you’re there. There are a few restaurants along the road that lead from the highway to the main entrance. All claim to do the best Yucatan food. Some do buffets and others are sit-down restaurants. We were attracted to the local market that had a few restaurants surrounding it. When you leave Chichen Itza, you pass through the little town of Piste. To your right, you’ll see the church and just across from the church on the left, you’ll see a row of restaurants. All of them are serving up really reasonably priced Yucatan street food. We ate at the one on the corner called La Gran Chaya. Their cochinita pibil (slow roasted pork) might just be the best I ate during my whole trip to the Yucatan. I had a cochinita torta which cost 20 pesos ($1). 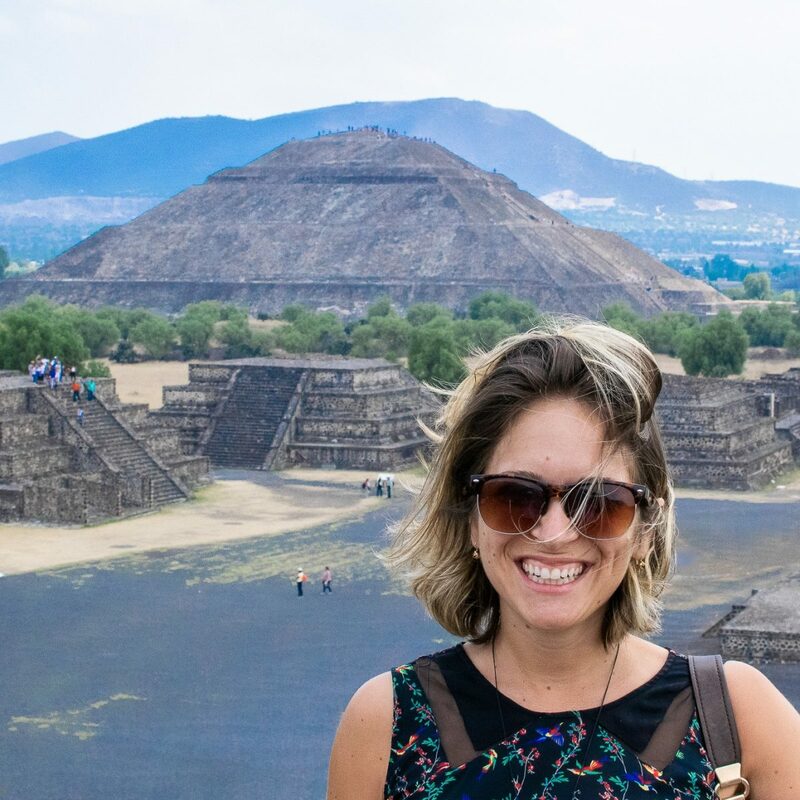 If you are planning a trip to Mexico, be sure to check out all of my other posts about this amazing country in the Mexico section of the blog.